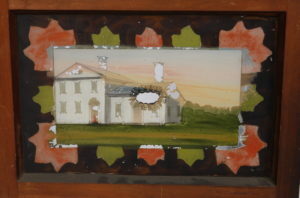 Winchester CT Pillar & Scroll shelf clock by Riley Whiting in as-found Estate Condition. 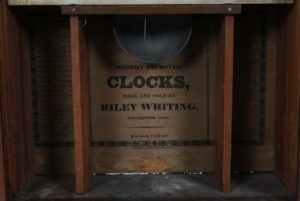 This is the classic Eli Terry Patent shelf clock design from the early 1800s adapted by Riley Whiting to avoid the Terry Patent. 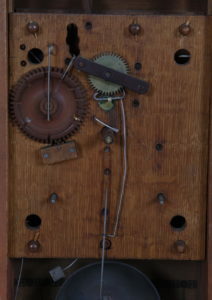 The wooden cross bar across the escape wheel is a “signature element” in the identification of the Whiting movement. The key aspect of this example is the condition and the fact that both glasses are untouched and original. 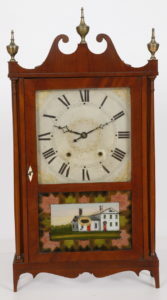 Today’s market is filled with wood works CT shelf clocks with a myriad of repairs/replacements/restorations. 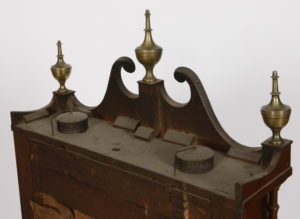 In fact the auctions are filled with pillar & scroll clocks with replaced feet, replaced crest, replaced/cracked glasses, replaced works etc.. This is a choice example in original condition and one of the very few that I have seen in recent times worth investing in. 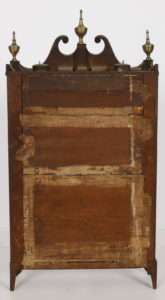 Note the shrinkage cracks in the scrolls due to differential shrinkage between the applied thick Mahogany veneer and the Pine substrate. 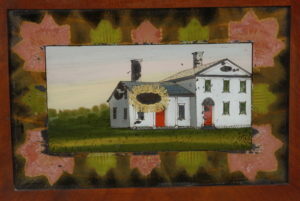 This is a natural occurrence from 200 years of “air age.” Even the original dust covers have remained with the clock ! 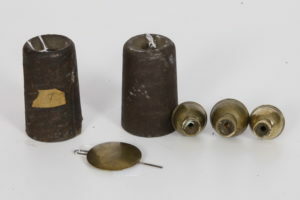 The three period early 19th Century cast brass finials are a nice surprise to find as finials are commonly lost/replaced. 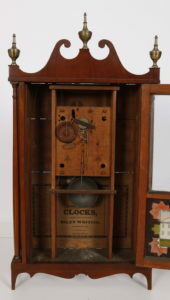 The clock retains its original weights, pendulum & winding crank.